RELATIVITY - joke or swindle? RELATIVITY - joke or swindle ? Louis Essen re-states his view that Einstein's theory of relativity contains basic and fatal flaws. Some of your contributors find it difficult to accept my contention (WW October, 1978) that Einstein's theory of relativity is invalidated by its internal errors. Butterfield for example (WW February, 1987) denies that there is any duplication of units or any harm in obtaining results from thought-experiments. Moreover, if my contention is correct, the new experimental work described by Aspden (EWW, August, 1987 ) is not required to disprove the theory, although it might confirm that his assumptions were wrong. This is not to suggest that experimental results are not important but they should be considered as steps in the development of new theories. Discussions about the theory tend to be very involved and your readers may be interested in a brief history of the subject which I wrote some time ago for a friend who wanted to know what the controversy was about and in particular what was the significance of the clock paradox. The theory was an attempt to explain the result of an experiment which had been made to measure the velocity of the earth through space. Scientists reasoned that, since light is an electromagnetic wave travelling through space with a velocity denoted by the symbol c, and the earth is travelling through space with a velocity v, it should be possible to measure v by an optical experiment carried out in the laboratory. Michelson and Morley designed and used an interferometer for this purpose. A beam of light was split into two parts which were directed along the two arms of the instrument at right angles to each other, the two beams being reflected back to recombine and form interference fringes. The instrument was turned through a right angle so that, if one of the arms was initially parallel to earth's motion, it became at right angles to this direction. It was expected that there would be a movement of the fringes, from which the velocity of the earth could be calculated, but no change at all was observed. There have always been ... critics: Rutherford treated it as a joke; Soddy called it a swindle; Bertrand Russell suggested it was all contained in the Lorentz transformation equations; and many scientists commented on its contradictions. Fitzgerald and Lorentz pointed out that this result would be obtained if the arm of the interferometer which was moving parallel with the earth was, in consequence of this movement, reduced in length by the amount (1-v²/c²)½. Such an arbitrary assumption did not constitute a satisfactory explanation and scientists tried to think of a more fundamental cause. But there have always been its critics: Rutherford treated it as a joke; Soddy called it a swindle; Bertrand Russel suggested that it was all contained in the Lorentz transformation equations; and many scientists commented on its contradictions. These adverse opinions, together with the fact that the small effects predicted by the theory were becoming of significance to the definition of the unit of atomic time, prompted me to study Einstein's paper. I found that it was written in imprecise language, that one assumption was in two contradictory forms and that it contained two serious errors. ... he concluded that, at the end of the journey, the time recorded by the moving clock was less than that recorded by the stationary clock. The result did not follow from the experiment, but was simply an assumption slipped in implicitly during the complicated procedure. The essential feature of science is its dependcnce on experiment. Results of experiment are expressed in terms of units which must not be duplicated if contradictions are to be avoided and units of measurement are the only quantities which can be made constant by definition. When Einstein wrote his paper, two of the units were those of length and time. Velocity was measured in terms of these units. Einstein defined the velocity of light as a universal constant and thus broke a fundamental rule of science. One of the predictions of the theory was that a moving clock goes more slowly than an identical stationary clock. Taking into account the basic assumption of the theory that uniform velocity is purely relative, it follows that each clock goes more-slowly than the other when viewed from the position of the other. This prediction is strange but not logically impossible. Einstein then made his second mistake in the course of a thought-experiment. He imagined that two clocks were initially together and that one of them moved away in a number of straight line paths, at a uniform velocity, finally returning to the starting point. He concluded that on its return the moving clock was slower than the stationary clock. Moreover, since only uniform motion is involved there is no way of distinguishing between the two and each clock goes more slowly than the other. This result is known as the clock paradox or, since the clocks are sometimes likened to identical twins, one of whom ages more slowly than the other, the twin paradox. ... I do not think Rutherford would have regarded (the theory) as a joke had he realised how it would retard the rational development of science. Einstein defined the velocity of light as a universal constant and thus broke one of the fundamental rules of science. Hundreds of thousands of words have been written about the paradox but the explanation is simple, arising from Einstein's use of the expression, "as viewed from". Clearly if the time of one clock is viewed to be slower than the other even when it has returned to the same position as the other then it must indeed be slower. But the rates of distant clocks are not compared by viewing them. Ticks from them are received and counted on a separate dial, a process now carried out continuously throughout the world for the synchronization of atomic time. It is the reading on this subsidiary dial which would be less and not that on the dial of the clock itself. If the thought-experiment is carried out correctly, the result is that the time of the moving clock as measured at the position of the stationary clock is less than that of the stationary clock. This is the same as the initial prediction, which is as it should be since a thought-experiment cannot give a result differing from the information put into it. 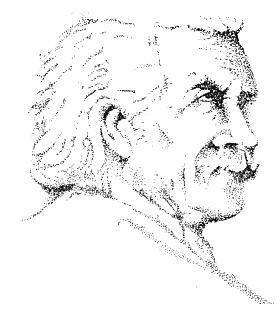 Einstein's use of a thought-experiment, together with his ignorance of experimental techniques, gave a result which footed himself and generations of scientists. He convinced himself that the theory yielded the result he wanted, because the contraction of time is accompanied by the contraction of length needed to explain the Michelson-Morley result. The round trip could not have been made without accelerations being applied, but Einstein ignored their possible effect on the rate of the clock, thus implicitly assuming that they had no effect. Some years later, in 1918, he used another thought-experiment in an attempt to answer criticisms of the paradox result. One of the clocks again made a round trip, the changes of direction being achieved by switching gravitational fields on and off at various stages of the journey, the time recorded by the moving clock was less than that recorded by the stationary clock. The result did not follow from the experiment, but was simply an assumption slipped in implicitly during the complicated procedure. The slowing down of clocks which he had previously attributed to uniform velocity, acceleration having no effect, he now attributed to acceleration, a line of argument followed in many textbooks. Claims frequently made that the theory is supported by experimental evidence do not withstand a close scrutiny. There are grave doubts about Eddington's claim, both as regards the predicted value which was increased by a factor of 2 from that first given by Einstein and the way the results were analysed some of the readings being discarded. The same criticism applies to a more recent experiment performed, at considerable expense, in 1972. Four atomic clocks were flown round the world and the times recorded by them were compared with the times recorded by similar clocks in Washington. The results obtained from the individual clocks differed by as much as 300 nanoseconds. This absurdly optimistic conclusion was accepted and given wide publicity in the scientific literature and by the media as a confirmation of the clock paradox. All the experiment showed was that the clocks were not sufficiently accurate to detect the small effect predicted. Why have scientists accepted a theory which contains obvious errors and lacks any genuine experimental support? It is a difficult question, but a number of reasons can be suggested. There is first the ambiguous language used by Einstein and the nature of his errors. Units of measurements, though of fundamental importance, are seldom discussed outside specialist circles and the errors in clock comparisons are hidden away in the thought experiments. Einstein's use of a thought experiment, together with his ignorance of experimental techniques, gave a result which fooled himself and generations of scientists. Then there is the prestige of its advocates. Eddington had the full support of the Royal Astronomical Society, the Royal Society and scientific establishments throughout the world. Taking their cue from scientists, important people in other walks of life referred to it as an outstanding achievement of the human intellect. Another powerful reason for its acceptance was suggested to me by a former president of the Royal Society. He confessed that he did not understand the theory himself, not being an expert in the subject, but he thought it must be right because he had found it so useful. This is a very important requirement in any theory but it does not follow that errors in it should be ignored. Dr. Louis Essen, D.Sc., F.R.S., has spent a lifetime working at the NPL on the measurement of time and frequency. He built the first caesium clock in 1955 and determined the velocity of light by cavity resonator, in the process showing that Michelson's value was 17km/s low. In 1959, he was awarded the Popov Gold Medal of the USSR Academy of Sciences and also the OBE.